Hub are mid-market developers delivering beautifully designed, aspirational homes in well-connected parts of London. Their approach is to take the time to understand the areas and communities in which they work, always seeking to make a positive contribution. The building comprises 173 two & three-bed rental apartments with retail provision at street level. 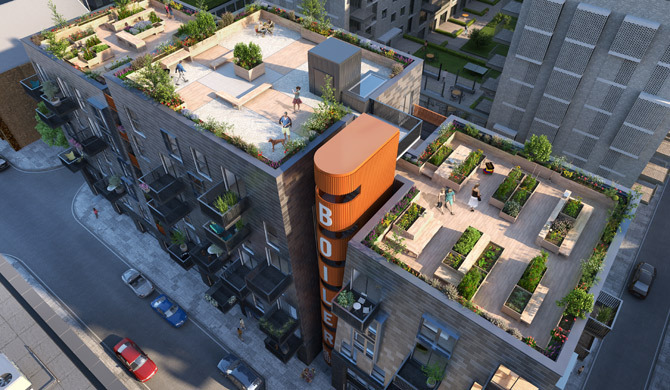 All apartments are provided with generous living space and private balconies and occupants can make use of the social entertainment spaces, a BBQ terrace and rooftop allotments. The M&E design adheres to the London Plan energy hierarchy and prioritises a passive-led approach to reducing CO2 emissions developed in collaboration with the lead designer, Newground Architects. The onsite CHP-led energy centre provides low carbon heating throughout the building. 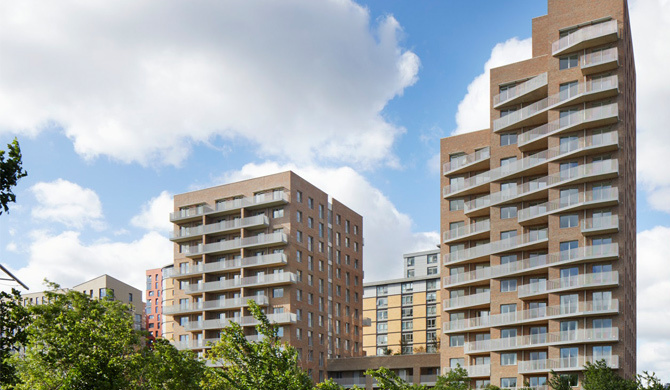 The need for comfort cooling has been avoided through the use of solar control measures and mixed-mode ventilation to the apartments, whilst managing external noise impacts from nearby road and rail networks. The Boiler House provides 54 homes within a contemporary cross-laminated timber building. Designed as a pavilion, its tapering shape reflects the factory chimneys that once stood there. A ‘green’ building, it has been engineered to ensure a lower carbon footprint and provides residents with balconies, communal roof gardens and allotments. The Material Store, the larger of the two buildings, comprises four ‘warehouse’ blocks of differing heights rising above a podium around a central landscaped garden. A key objective is provision of shared facilities as catalyst for creating a sense of community. These include play areas, function room, barbeque area, space for outdoor exercise and allotments for gardening. Both buildings comprise commercial space at street level requiring BREEAM Very Good certification, with the apartments targeting a Code for Sustainable Homes Level 4 rating.